It is likely that the earliest settlement in this area dates back about 1500 years. The name comes from Old English Hagawic and refers to a settlement surrounded by hedging, perhaps of hawthorns. The recorded history of the town is fuller however after the Norman invasion of Britain in 1066. A Norman family, the Lovels, became associates of the future King David of Scotland when he was at the London court of King Henry I in the early 12th Century and were granted lands in the area by him when he returned north to become ruler in 1124. The main base of the Lovels came to be at Castle Cary in Somerset, but they established Hawick Castle a motte and bailey structure, during the 12th Century. It’s known there was a church nearby in 1183, and that it was dedicated to St Mary in 1214. The ‘Mote’ hill still stands but the defensive centre of the town moved a little downhill to the confluence of the rivers Slitrig and Teviot and Drumlanrig’s Tower came to be the stronghold, from about 1412, of the Douglas family (Baron Drumlanrig) and then, from 1671, their successors the Scotts (latterly Dukes of Buccleuch). A royal charter of 1511 granted the Barony of Hawick, with its liberties and privileges, to Sir William Douglas of Drumlanrig. However this cannot have been the first charter granted to Hawick as Burgesses of Hawick are mentioned in documents as early as 1433. The 1511 document records the lands which formed the Barony of Hawick, describes the powers of the Magistrates, and instructs that Sir William and his heirs are to be paid an arrow ‘in blench-ferme’ [a nominal payment, only if requested] annually at the Feast of the Assumption of the Blessed Virgin Mary (August 15th). This then allowed the little town to hold markets, which of course would bring traders and create income. The scene was perhaps set for prosperity but these were difficult times. 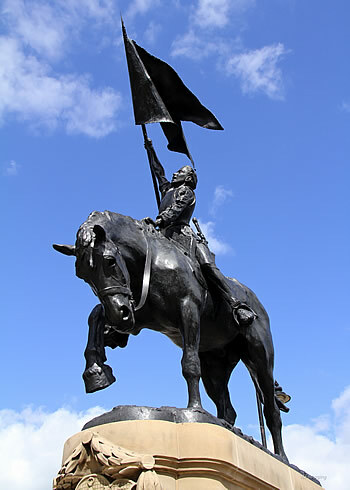 Hawick, Teviotdale and Liddesdale were in the Marchlands or Borders between Scotland and England and were to suffer from wars, raiding and reiving until at least the Union of the Crowns in 1603. The 16th Century was hard, with the Battle of Flodden catastrophically lost in 1513. A skirmish at Hornshole, two miles from Drumlanrig’s Tower, in 1514, saw local youths overcome a raiding party from Hexham, and capture their banner. 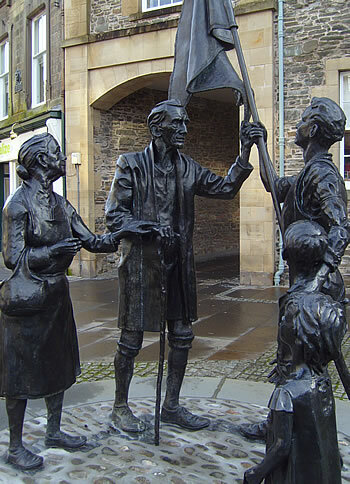 Statuary at each end of Hawick’s High Street commemorates that fight, and a replica of the flag is at the centre of the town’s annual festival in early June. For decades, this raiding continued, peaking during the ‘Rough Wooing’ with many Borders settlements being burned and looted. This conflict between late 1543 and the spring of 1550 followed war being declared by Henry VIII of England, in an attempt to force the Scots to agree to a marriage between his son Edward and the infant Mary, Queen of Scots. This turbulence reflected national interests, but for Hawick and the wider Borders personal and family interests were always to the fore. Reiving was a way of life. The motto of Scotts of Harden ‘There will be moonlight again’ is a telling reminder that moonlight provided the perfect condition for relieving others of their livestock. When a wife handed her reiver husband his spurs, it was a clear instruction to fill the larder! Loss of stock was therefore one risk. Loss of land was another. The burgh charter had granted lands to the burgesses, and some of that would be used ‘in common’. Burgesses would have the right to graze a certain number of animals on the common land, but there was always the risk that neighbouring landowners would encroach. Some of these parcels of land would after all be several miles from the town. This led to the Common Riding, known elsewhere as the Riding of the Marches, to check that boundary markers were in the correct place and encroachment had not occurred. So, Hawick’s annual event in June blends the commemoration of its youthful defenders at Hornshole with the protection of its common land, while the Reivers’ Festival of late March also highlights the customs and lifestyle of the town. This is a town with a long history!